With the Overland Bridge construction project nearing completion, the Florida Department of Transportation (FDOT) is moving forward with plans to expand the Fuller Warren Bridge and I-95's interchange with I-10. Here's a visual look at the details. 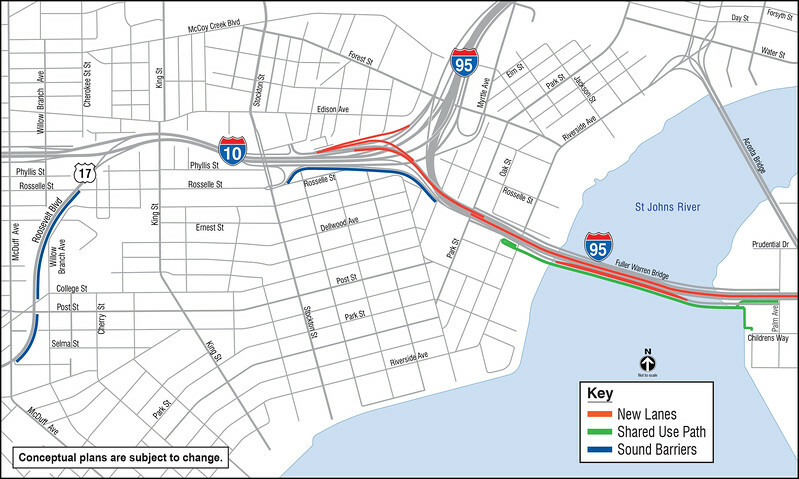 On Thursday, June 1, FDOT plans to host an open house for Your10and95 project which involves operational improvements to Interstate 10, Interstate 95, the Fuller Warren Bridge and U.S.17 northbound from McDuff Avenue to Rosselle Street. The open house is scheduled for Thursday, June 1, from 4:30-6:30 p.m. at the FDOT’s Training Center Building, 2198 Edison Avenue, Jacksonville, Florida 32204. According to the FDOT, the operational improvements are necessary for Your10and95 to cope with the increasing volume of traffic. 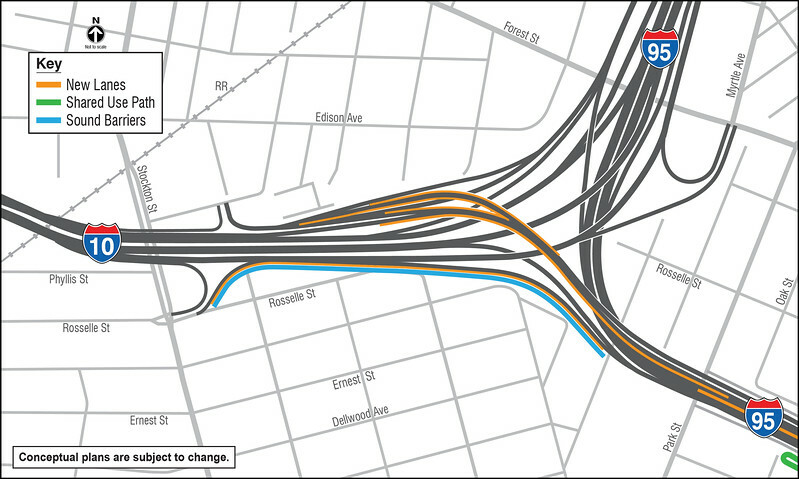 Currently, approximately 250,000 vehicles use the interchange every day. This number is expected to rise dramatically to approximately 290,000 daily users in 2040. 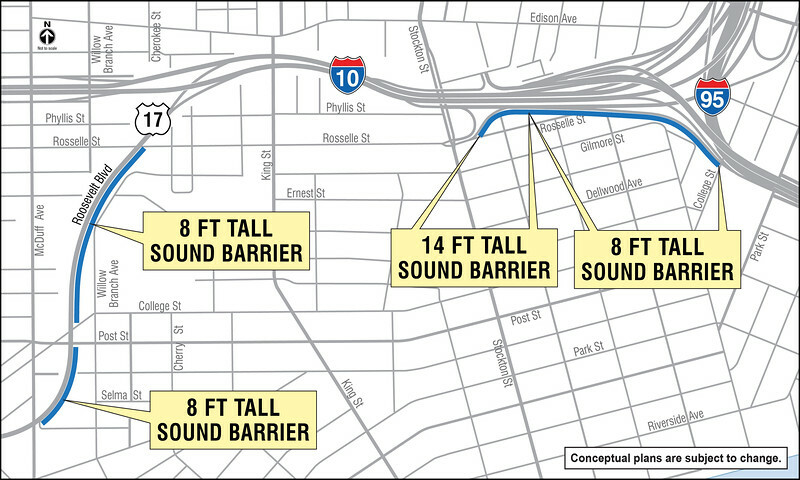 To accommodate that increase, construction will begin in Summer 2017 on the expansion of the Fuller Warren Bridge and operational improvements to the I-95/I-10 interchange and the Roosevelt Expressway. Additional improvements include the construction of new sound barrier walls and a shared use path for pedestrians and bicyclist that will connect Riverside with San Marco. The $126 million project is scheduled to be completed by Summer 2020.